The Great Dane is a dog that’s as big of heart as it is just plain big. These leggy, massive creatures absolutely love their families, and they’re known for constantly seeking the affection of their people. I like to say the Great Dane is so big because it has to hold such a huge heart. The Great Dane is as full of love as it is tall. One of the world’s tallest breeds, it can knock over a full grown adult in its exuberance. Although it’s massive, it’s also one of the sweetest of all dog breeds. The Great Dane as it’s known today originated in the middle of the 16th century. During this time, many European countries began to import long-legged dogs which were crossbred between the English Mastiff and the Irish Wolfhound. However, extremely large boarhounds bearing a striking resemblance to Danes appear in 13th and 14th-century Greek frescoes. In addition, to that large dogs similar to the Great Dane are depicted on runestones in Scandinavia, 5th century Denmark coins, and in the Old Norse poems collection. It’s thought that all of these depictions are precursors to the modern Great Dane. The Dane’s enormous size might make it appear dangerous or imposing to some, but it’s nature couldn’t be further from that. Basically an extra extra large lapdog, the breed is known for seeking physical affection from family members – both human and animal. In fact, they’re known as “the world’s biggest lapdog” because of their tendency to lean against or sit on their owners. Generally speaking, Great Danes get along extremely well with other dogs, animals, and people. They’re not known for aggressiveness or a high prey drive, and they absolutely adore children. As with all dogs, proper socialization is key to help capitalize on the wonderful disposition of the Great Dane. The Great Dane is an massive dog. While this breed can be quite heavy – topping out at over 150 pounds in some cases – it’s their height that they’re known for. This giraffe of the dog world averages around 3 feet tall from paw to shoulder, with the largest Great Dane, Zeus, measuring almost 4 tall from paw to shoulder. Because of their sheer size and intense desire to be loved, it’s important to be careful with them when they’re around young children or the elderly. Proper training is key because a dog this big can injure someone with its love. This breed may be full of love, but it’s not overly full of energy. An adult Great Dane only needs one or two good walks a day to keep it healthy and happy. The rest of the time, they’re content to loll about with the family. The only time exercise is a worry is when Danes are puppies. They grow so fast that they have to be monitored and activity minimized as much as possible to prevent injury. The Great Dane is more prone to several health issues. Some of these are common in all large breed dogs, but some are far more common in Danes. The Great Dane is also a generally short-lived giant breed. Their average lifespan is between 6 to 8 years of age. Although it should be noted that some Danes live to be 10 and older. 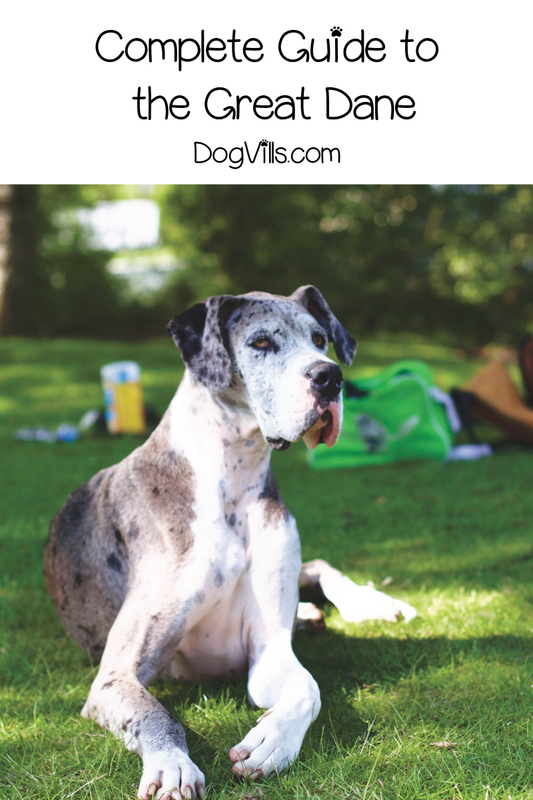 Gastric Torsion – Also called bloat, this is a condition in which the stomach becomes bloated due to eating or drinking too fast or too much play too soon after eating, and it’s the number one killer of Danes. After bloating, the stomach can twist, causing lack of blood flow to the stomach. It is painful and deadly. Stomach tacking is recommended during spaying or neutering. Cardiomyopathy – A disease of the heart muscle resulting in an enlarged heart. It’s common in several giant breeds. Fortunately, it usually occurs late in life and can often be managed with medication. Hip Dysplasia – This is a condition common to almost every large and giant breed dog. Hip dysplasia occurs when the head of the thigh bone doesn’t seat properly in the socket of the hip. In mild cases, it can be managed with medication. In severe cases, it requires surgery. Cancer – While cancer is a concern for any elderly dog, large or small, the Great Dane is more prone to bone cancer than other breeds. Unfortunately, this is the only down side to have one of these gentle giants, as the Great Dane life expectancy ranges between 8-10 years, which is about average for giant breed dogs. The AKC explains that some have made it to age 12, but on the other end of the spectrum, some only made it to 6 or 7 years of age. The Great Dane is exceedingly easy to groom. It has a short coat that only needs a weekly brushing – more in spring and fall when it blows its coat – and a weekly bathing. All other standard grooming policies apply such as regular nail trimming, tooth brushing, and ear cleaning. Although this breed can be incredibly large, they are born love bugs. The Great Dane may be huge, but its laid back personality, low energy level, ability to get along with other animals, and intense desire to love and be loved by its people makes it an excellent family dog for house or apartment living. As always, make adoption your first option. You’d be surprised at how often I’ve seen Danes at my local shelter. If you can’t find the Great Dane you’re looking for at your shelter, there are many breed-specific rescue sites online. There’s bound to be a big old buddy out there that’s perfect for you and your family. Do you have a Great Dane? Tell us what you love about this lovable giant!